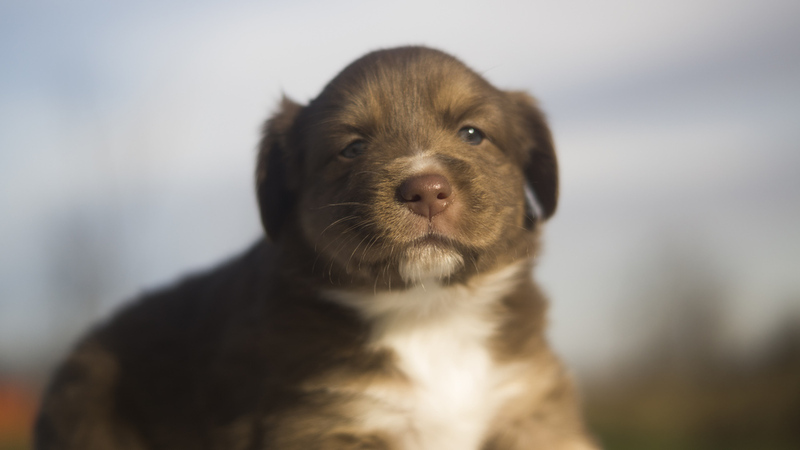 Available Mini Aussie puppies from October 2014 at Breezemore's Maine Miniature Australian Shepherds. From Marlo and our Blue Merle Bodie! 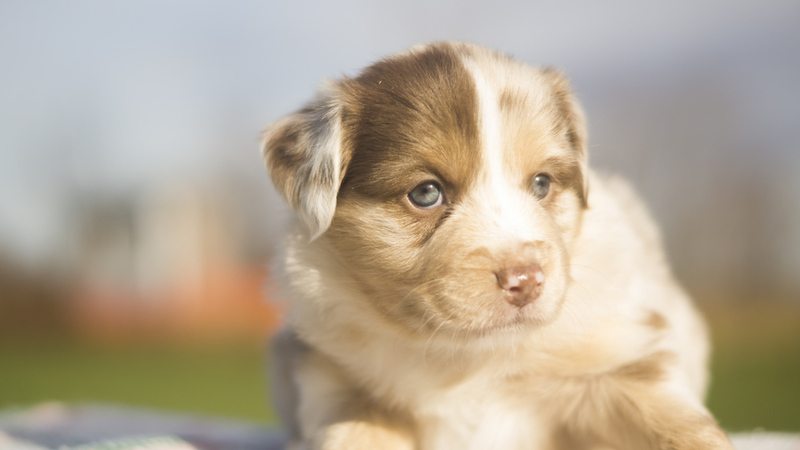 October 2014: New Miniature Australian Shepherd Puppies! Marlo and Bodie graced Breezemore with the arrival of eight beautiful and healthy puppies on October 14, 2014. Thanks to their parentage these puppies have been cleared for both MDR1 and HC, in addition Bodie has also been cleared for PRA/PRCD. Marlow’s first pup is a looker - with one bright blue eye, half a blaze, and bright copper trim she really stands out! She is stocky and very rugged, but full of life. She loves to run around with her siblings, but is also very quick to learn new things. Many thanks to the Maclean Family, her name is Bella! 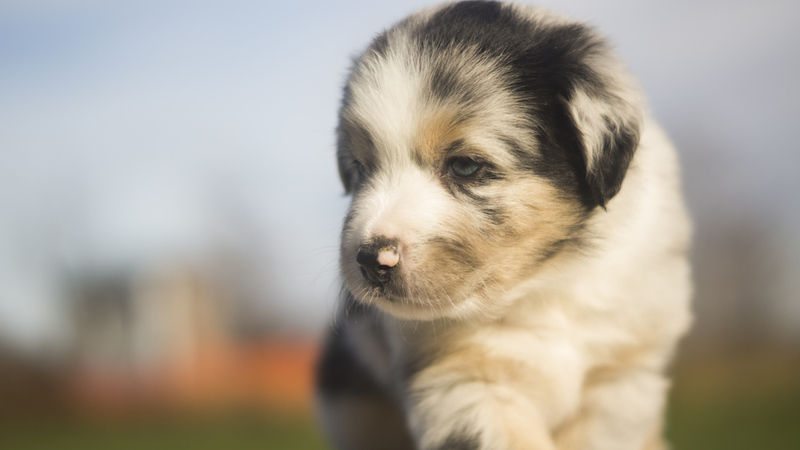 With a white blaze and copper markings, and small black freckles on her nose this pup is cute - very cute. She is a very gentle puppy who is great with everyone she comes into contact with, and like many of her siblings she is always ready to sit down and snuggle - filled with plenty of puppy kisses of course! Thank you Sara - this little girls name is Kali. This is Bodie’s boy through and through. He is a large pup, with an even bigger personality. He takes after his father - constantly in a state of happiness with plenty of love to share with everyone he meets. With one bright blue eye, beautiful merling, and a natural tail; this boy is downright gorgeous…and sturdy! Many thanks to Craig and Jen - his new name is Rudy! This is one gorgeous red head with a personality to boot! She is very outgoing, and eager to meet new people and potential playmates. With a pretty red coat, nice copper, and bright white she is a beautiful puppy who is ready to play! Thank you to Henry and Krystal - they have named her Pippa! Outgoing and playful with bright copper that offsets nicely with her red coat makes for a beautiful puppy. She is a great pup, very willing to please and responds well to rewards of all sorts - especially play time!